You can swing by to observe the chickens anytime you are in the garden, they love the occasional natural treat and are dearly loved by all our community. They produce wonderful manure for us to add to our compost, which is a real bonus for the garden’s soil fertility. The hens have their very own hen coop and enclosure and love to hang out there 24/7. And there are no roosters allowed in our urban garden environment, too much crowing going on for our friendly neighbors. The enclosure is located between the Cherry Shed and the Children’s Garden at CSG, CLICK HERE for the location on a map. 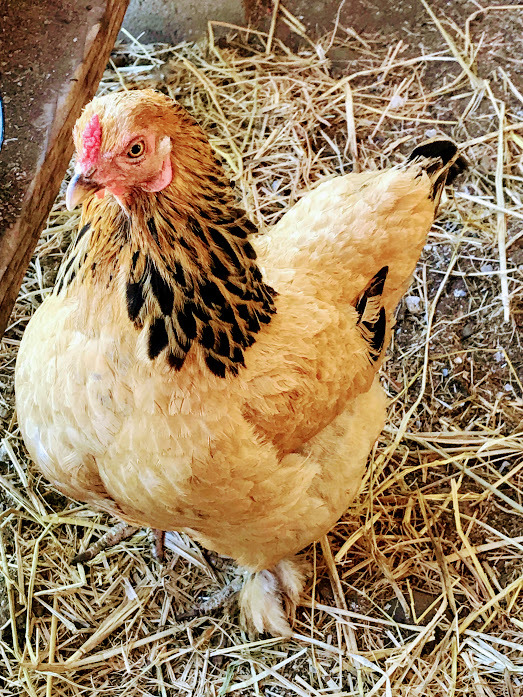 CSG participates in the Silicon Valley Tour De Coup, a local event to showcase the wonderful world of backyard chicken keeping where residents open their backyards once a year, so you can view their chicken coops. Want to get to know our hens by name? Features: She has feathery ‘spurs’ on her feet, which are all feathers and no spurs! It looks like she’s wearing fluffy slippers. Personality: She is the largest of our 3 Bantam hens, but is still a little shy. She loves to eat treats and can be seen taking a chance whenever some good chicken scratch is handed out. Features: Wyandottes [similar to Seabrights] are quite striking looking and it seems like someones traced each feather with a black Sharpie! We think she is very beautiful, and love her fluffy under-feathers. 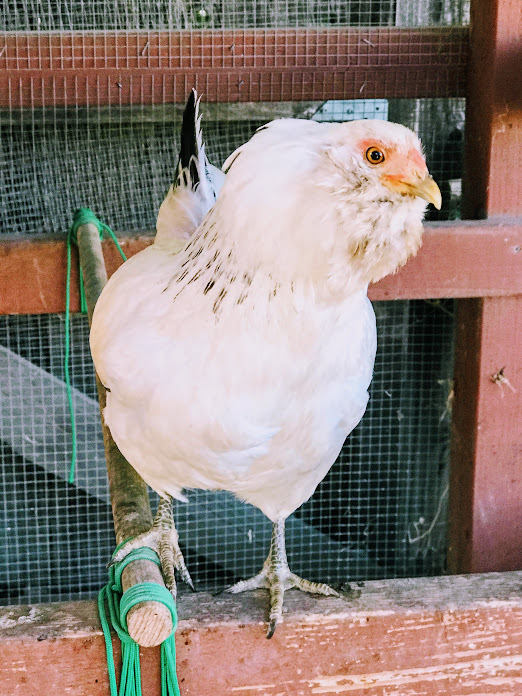 Personality: Being the largest sized hen, Fancy tends to think she’s the boss! You may observe her chasing the others when it’s dinner time and asserting her status. Personality: Because of her fluffy top knot, she may not see as well as the others. In any case, she appears to be the most adventurous of the Bantams while still very chilled-out. Features: She is smallest of the 3 larger hens, and her feathers aren’t as fluffy. Maybe the reason she can ‘cha cha’ faster around the coup is due to great aero-dynamics from her lovely, smooth feathers? Just an idea! Personality: Cha Cha is quite a confident hen and will often be the bravest to approach a human when the tenders are feeding in the coup. Features: Lindy was named after the famous aviator Charles Lindbergh, because she loves to fly! She lays small, bluish colored eggs. 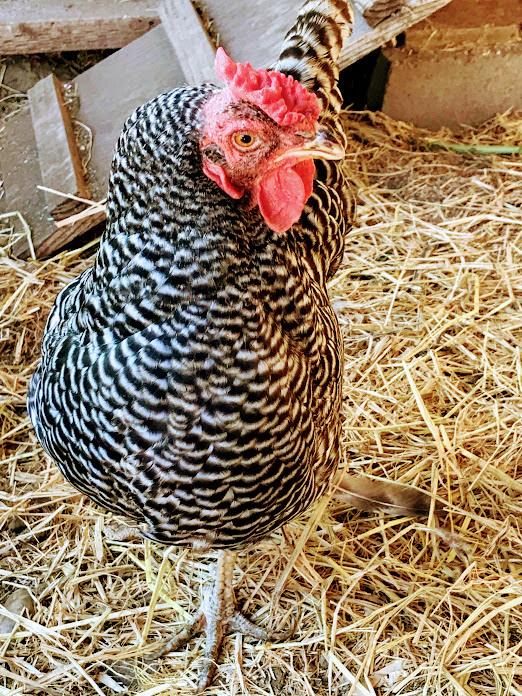 Personality: Lindy is very shy, tends to be on the bottom of the pecking order, and is quite independent and loves to nest in the nesting boxes. She is very sweet and clever, see if you can spot her! 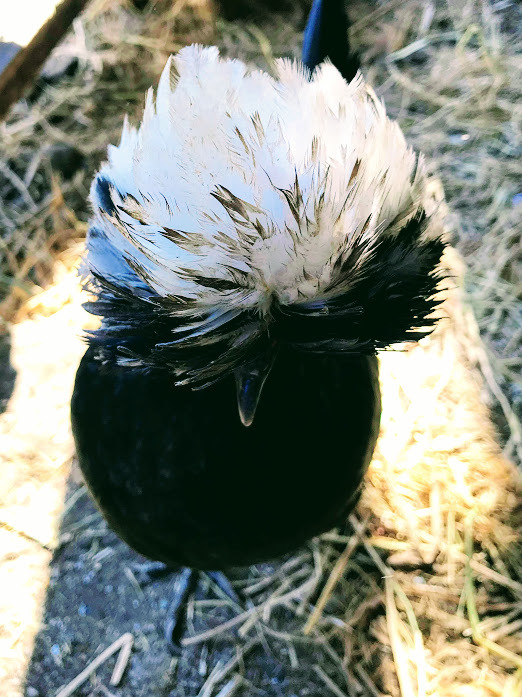 Features: Bella’s feathers look like little black and white clouds in a row and she has a double-ridged comb on her head. She is almost at the end of her laying days, but if Bella does lay an egg, it will be a dark chocolate brown color like an Easter egg! Personality: The name Bella is related to the Spanish, Italian and Latin words for beautiful, but her breed is French! 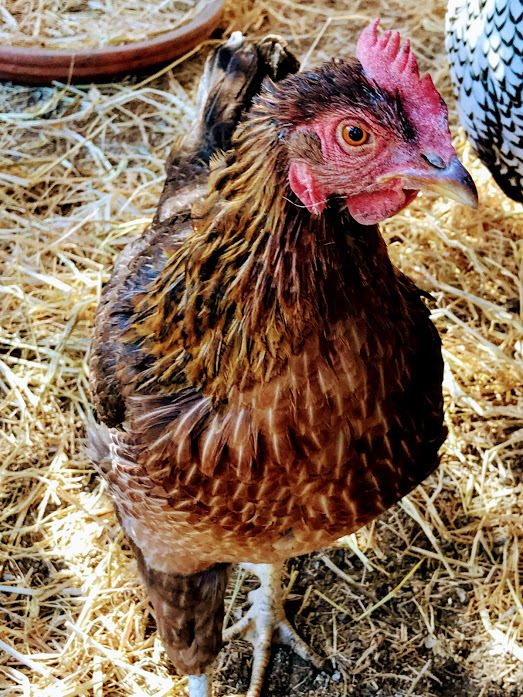 She is a lovely hen with a sweet personality, and is very polite in the coop and waits her turn for a treat. Feel free to tell her she’s the most ‘Bella’ of all the chickens! Each hen normally averages about two eggs every three days, although it gets less each year they grow older. They lay year round, although production seems to increase somewhat during the longer days of summer. Fresh eggs are wonderfully tasty compared to store-bought eggs. It’s like the difference between a home-grown tomato and a grocery store tomato. A half dozen or so Charles Street Garden members take care of the chickens. Each caretaker volunteers to do the necessary tasks one day per week. 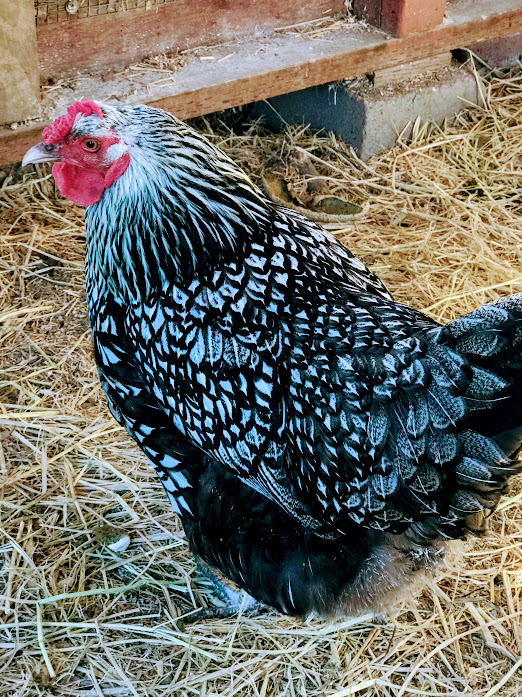 Tasks include cleaning the coop floor, collecting droppings (a valued fertilizer in the garden), and topping off the water, organic feed, and oyster shells. The ongoing cost of maintaining the chickens is covered by contributions and by egg raffles at garden events such as the Spring Plant Sale. The eggs are amazing to taste, hopefully everyone will get to try one, some day! We buy the ladies organic chicken feed at Sam’s Downtown Feed & Pet Supply in San Jose. Sam’s also sells the crushed oyster shells (calcium) that the chickens need for strong egg shells. A very large part of their diet is made up of vegetables, fruits, and greens happily provided by the Charles Street gardeners. They will eat a large variety of natural foods, but they do tend to prefer some over others. For example, just like us, they like strawberries and kale better than bind weed! And we avoid feeding them anything processed like cake, bread or cooked pasta / rice. Finally, they particularly like a wild birdseed mix of black oil sunflower seeds and millet. And they never say no to some delicious left-over melon rinds or fruit to peck, make sure you save them and bring them in. Spring 2012 – We got our first three chickens from Melissa at Full Circle Farm. Melissa is our chicken expert; she has provided indispensable advice about chicken rearing, well-being, and housing. All of original hens have now gone, but Janet Hamma who is the driving force behind bringing the hens to our garden, remembers each and every one. Spring 2015 – Along came our new brood of 6 new chicks, also from Full Circle Farm. We asked the gardeners and visitors to suggest names for the bantams, so they were named very proudly by our wonderful community …. thats you! bantams are a smaller breed of chicken, so our 3 little chickens aren’t the necessarily the youngest, they are a different breed. Same goes for the eggs; the bantam eggs will be much smaller than Cha Cha, Fancy and Bella’s eggs. COOP: a closed space with nesting boxes and roosts, where the chickens lay eggs and sleep. 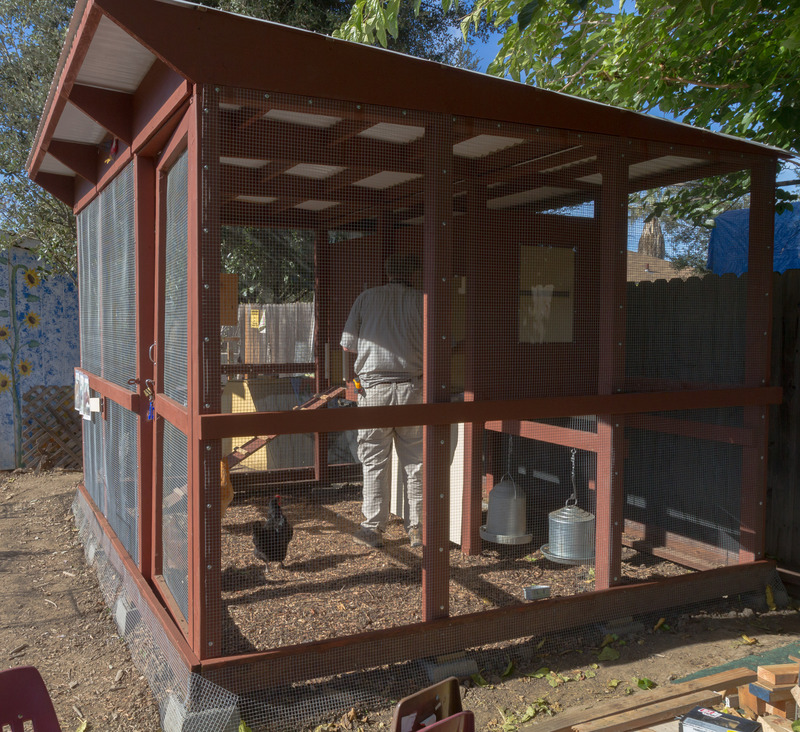 ENCLOSURE: a roofed structure with screened, mesh sides that contains the coop and a dirt floor for scratching and dusting. CHICKEN TRACTOR: a portable, bottomless cage that can be moved around to give the chickens a variety of foraging areas. And a spring screen-door closer that sounds like something from a Tennessee Williams play!